One of the perks of being a grown-up is that no one can tell you how you to celebrate holidays like Thanksgiving. You're free to feast with whoever you want, and on whatever you want. That means, of course, that if you want to swap a traditional turkey meal for, say, a spread of KFC fried chicken or Big Macs from Mickey D's, that's totally your prerogative. So, if that's your plan this year, or you're in the mood to bring some unconventional side dishes for your host (or just need to know where to grab a snack en route to wherever it is you're celebrating), here are some of the best fast food chains that'll be open on November 22. Note: It never hurts to call ahead before you show up to your local outpost, though. Applebee's: Most locations open regular hours. Bob Evan's: Most locations open regular hours. 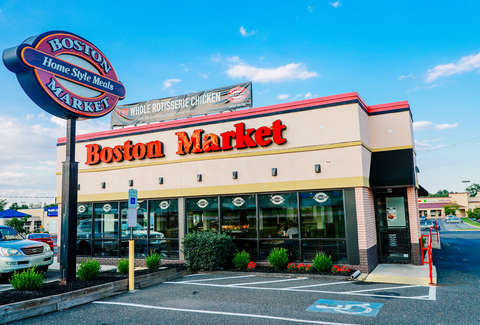 Boston Market: Most locations open regular hours. Burger King: Most locations open regular hours. Cracker Barrel: Most locations open regular hours. Denny's: Most locations open regular hours. Domino's Pizza: Most locations open regular hours. Dunkin': Most locations open regular hours. IHOP: Most locations open regular hours. Jack in the Box: Most locations open regular hours. KFC: Varies, but most locations open regular hours. Little Caesars: Most locations open regular hours. McDonald's: Varies, but most locations open regular hours. Papa John's: Most locations open regular hours. Pizza Hut: Most locations open regular hours. Qdoba: Most locations open regular hours. Sonic Drive-In: Most locations open regular hours. Starbucks: Most locations open regular hours. Steak 'n Shake: Most locations open regular hours. Waffle House: Most locations open regular hours. Wendy's: Most locations open regular hours. White Castle: Most locations open regular hours. Again, to ensure you don't end up wasting any time or gas schlepping out to any of these places only to find a locked door, you'd be wise to call ahead before you head out, since business hours may vary from location to location. Need to do some last minute grocery shopping? Check out our list of what's open on Thanksgiving this year. As for Black Friday shopping, here’s when most major stores open to kick off their big sales. Don't miss the best sales at Walmart, Target and GameStop.